in the Shinas-Hatta Project, Oman. National Mining Company (NMC) is a privately owned subsidiary of the MB Petroleum Group, based in Muscat, Oman and was set up in 1997 to explore for copper and gold in the Oman Ophiolite. NMC has spent about US$2.5 million on copper exploration mainly on this project, and over the last three years to September 2003 has completed 82 diamond drill holes totalling 5808 metres in defining a series of new VMS deposits totalling 3.5Mt of 3% copper. The current EL Block 1 was granted in October 2000, with exploration initially focused on possible vein-breccia gold-copper mineralisation associated with high-level intrusive complexes. Reconnaissance failed to find evidence of epithermal or breccia hosted gold mineralisation, so the focus was then switched to traditional VMS exploration because gold caps are a feature of these deposits in Oman. The copper deposits are hosted in submarine basalts of the Oman Ophiolite, a sheet of Cretaceous Tethyan seafloor that was thrust over basement rocks of the Arabian Shield. These VMS deposits are typical Cyprus-type and occur in clusters with pyritic copper-rich mounds with gold bearing gossans overlying lower grade feeder systems within the footwall basalts. The Sohar Region has a history of copper mining dating back to the Bronze Age, with more recent exploitation being carried out by the government owned Oman Mining Company (OMCO) on the Lasail Cyprus-type VMS deposits west of Sohar. Since 1970, the Ophiolite has experienced intensive regional multinational exploration resulting in the discovery of more than 44M tonnes of 1-2% Cu in three deposit groups including Lasail. NMC has employed an integrated approach in exploring for VMS deposits. Landsat imagery and aeromagnetic data has been used to target areas of alteration associated with fluid upflow zones, and then ground geophysics and geological reconnaissance mapping and geochemistry has been employed to define drill targets. These copper deposits respond well to EM, IP and magnetics, in cover situations down to 150 metres. NMC has discovered five outcropping deposits, the largest being 2 Mt at 2% Cu at Shinas and 1.5Mt at 3.5% Cu in three closely related deposits at Hatta. The Hatta deposits are located at a similar stratigraphic position to other known systems i.e. Lasail, near the contact of the (V1) Geotimes pillow basalts and the overlying (V2) Lasail seamount-related basalts. The Shinas deposit within the Alley Basalt is located much higher up in the volcanic sequence in a position not previously considered prospective for VMS mineralisation. NMC has shown that a systematic exploration programme, using technically advanced methods combined with refined geological models and field experience, can be very successful in finding new resources in areas previously considered unprospective or thoroughly tested. The three main deposits are currently the subject of a Feasibility Study that has carried on from a positive Pre-Feasibility Study completed in Sept 2002. Following expected completion of a positive study by the end of 2003, proposed development in 2004 envisages transport of 1M tonnes of ore annually to OMCO’s Lasail Plant where an upgraded Concentrator will produce saleable copper concentrates. The proposed Capex for development is US$6M. Northern Oman is situated at the eastern boundary of the Late Precambrian Panafrican crystalline metamorphic basement of Arabian Plate near its junction with the Eurasian Plate. The Gulf of Oman is a remnant of the Tethys Sea and overlies a shallow-dipping subduction zone, which extends eastwards below Iran. The Oman Mountains are geologically distinct from the remainder of the Arabian Peninsula, being part of the Alpine–Himalayan fold belt that extends from the Western Mediterranean to the Far East. They result from obduction to the southwest of Cretaceous Tethyan oceanic lithosphere over both autochthonous and allochthonous carbonate platform sequences that host the major petroleum resources in the Region. Ophiolites in this convergent margin Tethyan Suture Zone setting are prospective for chrome, nickel and Cyprus-type VMS deposits, and the excellently exposed 800 km long by 5-10 km thick Semail Ophiolite Belt in Oman is no exception. Ancient copper mining and smelting in the Sohar region based on VMS deposits provided a major source of metal for early Bronze Age cultures in Mesopotamia, and this development continued into the Middle Ages during the rise of Islam. The Omani Government has since 1970 sponsored regional mapping and systematic exploration conducted by various International Mining Groups. Early workers used standard prospecting and reconnaissance geochemical methods to locate the obvious old workings and drill tested the most significant prospects, resulting in the discovery of most of the outcropping VMS copper deposits in the region. The low-grade Sohar pyritic deposits totalling 14 M tonnes were subsequently mined during a period of high copper prices from 1983-1994 by the Oman Mining Co at Lasail, Aarja and Bayda. Since 1990, Omani Government sponsored exploration by OMCO, JICA and Bishimetal in the Yanqul, Ghuzayn and Daris areas has resulted in the discovery and definition of 17M tonnes of massive sulphide and stockwork sulphides in five gossan associated deposits averaging 1.2 % Cu, 1g/t Au at Hayl al Safal-Rakah. They were also successful recently at Ghuzayn where drilling of geophysical targets resulted in the discovery of 14 million tonnes of 1.4 % Cu in several blind deposits at depths of 100 to 250m. These companies focused on peak IP chargeability targets with coincident TEM responses within the prospective volcanics and drill tested all metal factor anomalies. None of these sulphide deposits have been exploited to date because repeated Feasibility Studies have shown the resources were uneconomic due to their overall poor quality, high capital requirements for development and historically low copper prices. All major mines and most prospects, including Hatta, Lasail, Aarja, Bayda, Ghuzayn, Rakah, Hayl as Safil and adjoining ore bodies, are not only at the top of the V1 Geotimes Unit or just within the V2 Lasail Unit, but also less than several kilometres from either ultra high-level intrusive complexes or interpreted primary syn-volcanic faults associated with the Lasail phase of magmatism. These Cu-Au deposits are spatially related to volcanic centres that had high associated heat flow and hydrothermal fluid discharge focused through key structural zones marked by altered and demagnetized areas. These features conceptually provide very valuable criteria in exploring for gold and base metal mineralisation elsewhere within the Semail Ophiolite. NMC’s overall strategy has been to utilise detailed Aeromagnetic and LandSat data to highlight prospective alteration zones in favourable stratigraphy, and following ground inspection for gossans has tested these areas with ground magnetic, IP and TEM surveys. It is apparent from drilling that the geophysical expression and in particular the TEM anomalism, at these shallow VMS deposits, is a reliable indication of the extent of massive sulphide mineralisation and resource potential. Therefore on going regional exploration will focus on areas where significant hydrothermal alteration has occurred. TEM surveys will then be used to evaluate the prospective stratigraphy for new blind deposits at shallow depth. In early 2001 the Hatta–Shinas area was selected for initial detailed evaluation for VMS deposits because we recognised the strong footwall-type alteration in Landsat images coincided with major structures and an extensive magnetic depletion zone at Hatta, as well as a discrete low around the Shinas ”gossan”. Earlier prospecting had identified several small structurally controlled copper-bearing gossans at Hatta West and Ajib, but focussed mapping in March discovered three new gold-copper bearing gossans at Hatta. The largest gossan in Wadi Hatta together with the Shinas prospect were then selected for geophysical evaluation and each gave discrete TEM conductive and IP chargeable responses typical of massive sulphides at shallow depth. These prime targets were then tested at 100m centres in Stage 1 diamond drilling in April-May, which confirmed they host +20 metre thick zones of relatively high-grade 2-4% Cu massive sulphide mineralisation. This successful result was achieved due the combination of experienced field geologists using flexible geological models and superior technical data derived from the latest Landsat, Aeromagnetic and ground geophysical interpretative techniques. These discoveries were sufficient to warrant a major programme of exploration to properly define the scale of mineable resources in this district. Stage 2 and Stage 3 detailed infill NQ resource drilling of these deposits was carried out at 25m-40m centres totalled 3074.15 metres in forty-eight drill holes. The gossans generally exhibit low- grade gold around 1/g/t Au and tend to cut out at shallow depths into supergene massive sulphides, therefore little effort was made to quantify oxide resources and the focus was on the main sulphide deposits. Shinas is the largest (1.9Mt) deposit in the project by virtue of its extensive sheet of massive sulphides and well-developed stockwork system compared to the smaller but richer massive sulphide dominant deposits at Hatta. The margins of this roughly oval in plan (150m x 125m) to funnel shaped deposit at depth, are partly constrained by syn and post volcanic faults within the host basalt breccia-hyaloclastite unit and overlying massive oxidised lava. A steep ESE trending early structure the “Southern Fault” and the similar northerly trending ‘Western Fault” mark two sides of the system. They control a focused stockwork stringer (QVS) zone at 80-150m depth that expands upwards beneath an extensive shallow dipping 10-35m thick semi-massive to massive sulphide seafloor breccia apron that is capped by gossan, mineralised sediment and fringing hanging-wall basalt. The sulphide mound facies is typically pyritic and brecciated with siliceous and chalcopyrite-rich infill; it contains significant gold at the northern and eastern margins in SH-01, SH-16 and SH-21. The central mound intersected by SH-20 and 27 provided MS zones of 35.5m at 1.73 % Cu and 47.3m at 2.1% Cu respectively. Sub-mound replacement breccia mineralisation grading down to dominant QVS material is typically chalcopyrite-rich grading 1-3% Cu, with weak gold. All grades attenuate at depth in the moderate to weak stringer mineralisation, however average grades over 1% Cu continue to 100-110m depth in the core zone. This 200m long by 100m wide SE trending pyritic massive sulphide lode containing 0.9Mt at 3.5% Cu, is very coherent and consistently mineralised, but has a strikingly copper-rich mound centred on HA-25 containing 8.45m at 11.3% Cu. This lies within a 33 metre thick zone of primary sulphides commencing at 15m and extending at depth into a chlorite-haematite-pyrite stringer zone. The deposit is controlled on all sides by post mineralisation faults trending E-W and ESE-SE, and wedges out towards the margins where elevated zinc and locally gold grades represent cooler parts of the mineralised system, for instance HA-16 has 7.55m at 1.65g/t Au, 8.97% Cu and 3.1% Zn in primary sulphides. 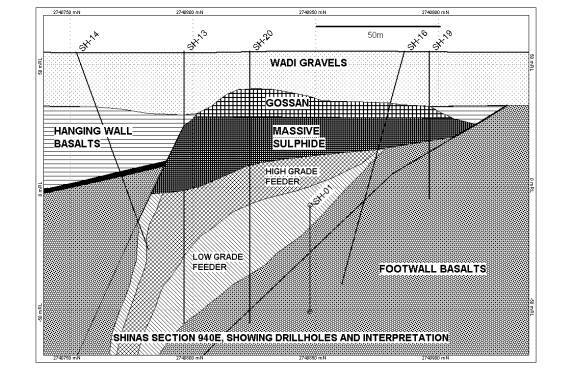 The exposed gossan (totalling perhaps 0.1Mt at 1g/t Au) at the northern end along Wadi Hatta grades south at depth into a thin chalcocite-rich supergene zone averaging 5.56% Cu over 7m in HA-16. Five shallow holes HE-04 to HE-08 in Stage 3 drilling tested the potential strike and dip extensions to the high-grade primary and supergene mineralisation intersected in Stage 2 drill holes HE-01&-02. Similar high-grade intersections in HE-04 (3.4M @ 7.47% Cu) and HE-05 confirmed the strong TEM anomaly and weak IP expression is associated with two thin parallel shallow dipping massive sulphides lenses with limited stringer mineralisation. However, the later holes HE-06 to –08 served to outline the limits to this small deposit. This deposit is 150m long and 80-100m wide and extends from a small gossan to the west along a SE plunge to a mound centred on the HS-05 which coincides with the peak TEM response. HS-05 provided a 25metre thick pyritic MS breccia mound intersection assaying 24m at 2.58% Cu from 16m depth above a proximal stringer zone. 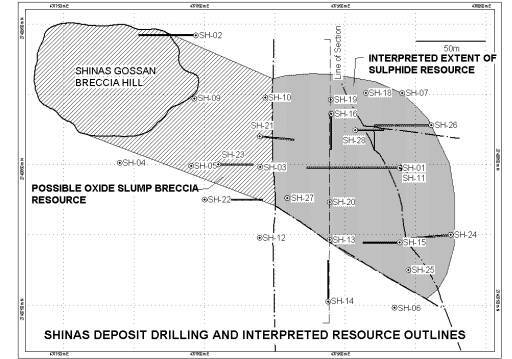 The deposit is faulted or wedges out rapidly to the east and north but extends as a 20º south dipping sheet gradually thinning to the south of HS-08 which intersected 10.4m of 3.82 % Cu at 45 metres. HS-03 sited 40m down dip from the gossan provided an initial excellent shallow ore intersection of 4.6m of high-grade massive sulphide from 23.3m assaying 7.40% Cu, 6.48% Zn, 0.79g/t Au and 38g/t Ag. The presence of unusually high zinc grades to 13% Zn at the top of the MS in HS-01 and -03 represents late seafloor sulphide deposition at the cooler periphery of the system. Preliminary resource evaluations for Shinas and Hatta were presented in the Pre- Feasibility Study. The combined sulphide resources at Shinas were calculated at 1.88M tonnes at 2.9% Cu, 0.55g/t Au, whereas at Hatta the resource was 0.9M tonnes at 3.1% Cu, 0.9% Zn and 0.3g/t Au. After the Stage 3 program of detailed infill drilling at 25m centres, these main resources were confirmed and increased marginally to approximately 3M tonnes at 3% copper. 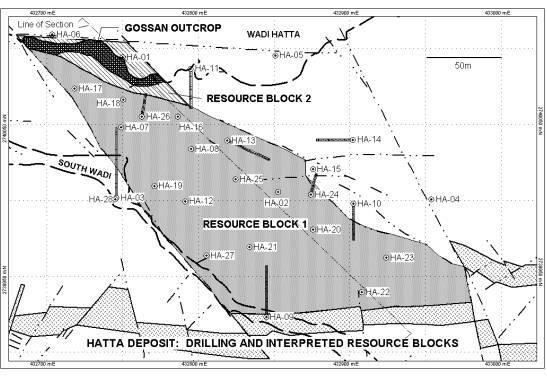 The resources in the other Hatta deposits have a combined total 0.5 M tonnes but only the Hatta South resource of 0.35Mt at 3% Cu is presently considered mineable. A high-grade central mound feature was defined in all three main deposits with HA-25 intersecting 33m @ 7.2%Cu and SH-27 intersecting 47m @ 2.1%Cu. At Hatta the HA-25 zone served to bring the overall grade of the deposit to 4% Cu. Definition drilling at Hatta south is ongoing, however estimated resources are 0.35Mt at 3.5% Cu with generally low Au and Zn except along the northern margin. At Hatta Extended drilling was disappointing and resulted in the indicated resource being confined to 100,000 tonnes at 4 %Cu and 0.6 g/tAu within two thin sub-parallel lenses. There could be up to 0.4M tonnes of gossan grading 1-2g/t Au at Shinas and Hatta, which may respond to CIP treatment, however this is not part of the current Feasibility. More rigorous resource definition is now underway including block modeling by independent consultants to determine the reliability and variability of the resources. It is clearly evident that these shallow copper sulphide resources represent the basis for an attractive open pit mining operation in this district. 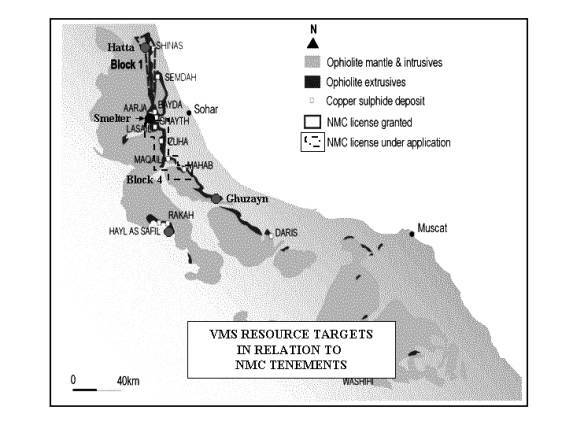 NMC has over 3 years organised an experienced team of mainly Australian consultants who completed a Pre-Feasibility Study in August 2002 that indicated developing these deposits was economically viable with a Capex of only US$6M, if the sulphide ore is trucked to Lasail and processed through a refurbished 20-year old concentrator. NMC is now undergoing a commercial Feasibility Study costed at US$1M and due for completion this December. This will verify the mineability of the resources, confirm the optimal floatation processing system to be installed in the refurbished Lasail concentrator and the viability of a new tailings waste disposal system at the nearby old Aarja mine pit. It is intended that commissioning of the mines and plant will take place within 6-8 months of receiving development approval from the Government and finalising agreements with OMCO and engineering contract groups. All the mining, transport of material and treatment process operations will be conducted by contracted specialist consultants directed by NMC professional staff. There is sufficient local expertise and regional based groups in the UAE to provide a quality workforce. It is intended to commence pre-strip contract mining by the end of March, and to mine at the annual rate of 1M tonnes of ore at an average grade of 3% Cu and 0.4 g/t. This will produce approximately 22,000t of copper and 8,000oz of gold annually which could generate annual revenues of US$38 million from concentrate sales and potential cash flow of US$16 million using a copper price of 75c/lb. Therefore capital payback may occur in the first full year of operation. NMC has shown that superior exploration methods will result in discovery of new deposits within areas previously considered thoroughly tested. Understanding of regional metallogeny and use of advanced technology plus dedicated geological footwork provides a potent combination for successful exploration. Proposed treatment of ore utilising the Governments existing facilities greatly reduces the capital required for development and establishes synergy with OMCO by providing local concentrate for smelting. NMC has only started its campaign to revitalize the Oman mining industry and this initial small development will serve to generate the capital to undertake much larger projects that will underpin its future and guarantee NMC a pre-eminent position in the region.